Bees and other pollinators – butterflies, hummingbirds, flies, beetles, and wasps – are an integral part of healthy ecosystems. These pollinators spread pollen to help plants reproduce, promoting biodiversity. Worldwide, many pollinator species are suffering. Worker bee colonies are particularly in danger as they are affected by colony collapse disorder, a phenomenon that has already resulted in the death of approximately 50% of bee hives in North America. In addition to addressing climate change and phasing out destructive chemical pesticides and herbicides, small-scale beekeeping is a critical tool to help address our current bee crisis, as responsible beekeeping provides safe spaces for bees to thrive. The Rock Creek Campus is dedicated to promoting pollinator health and has established an on campus apiary serving as an educational tool for campus programs and to promote education and research about bees and their habitats and threats to pollinator persistence. PCC is also certified as an affiliate of the Bee Campus USA program. Take a class in Backyard Beekeeping! 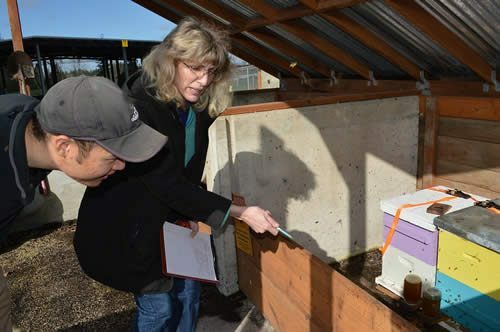 In an effort to increase the bee population on Rock Creek campus, the Sustainability office established the first hive in our apiary an April 2014. This Langstroth style hive and its bee colony sparked much campus interest and led to subsequent apiary expansion. The next two hives, Warre and Top Bar styles, are viewing hives, designed with transparent panels to view the work of the bees without disturbing them. The apiary has been relocated to an area adjacent to the campus greenhouses and expanded to eight hives, including a Flow Hive which allows honey to be harvested with minimal disruption to the bees. Plans for the apiary include additional Flow Hives and a bee hotel supporting native bee populations including mason and bumblebees. The Rock Creek campus is home to Master Beekeeper, Anne LeSenne. 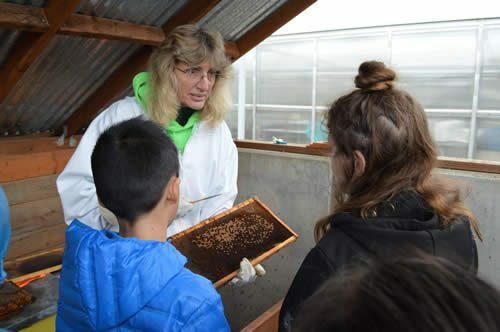 A critical staff member of our Landscape Technology program, it is Anne who oversees the health of the bee colonies, harvests the honey, and provides bee education to our students, stakeholders and partners. Contact Anne [opens in new window] for more information. 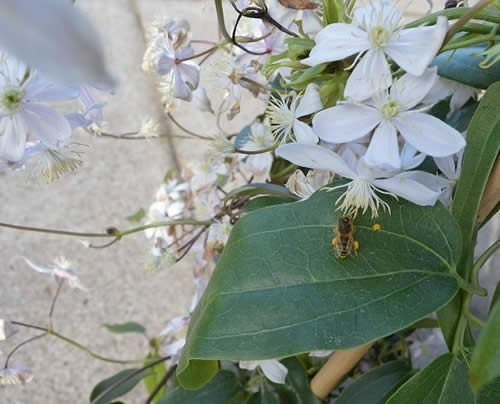 There are many ways for students to get involved and learn more about bees and pollinators. Email Anne or the Sustainability Coordinator about opportunities. 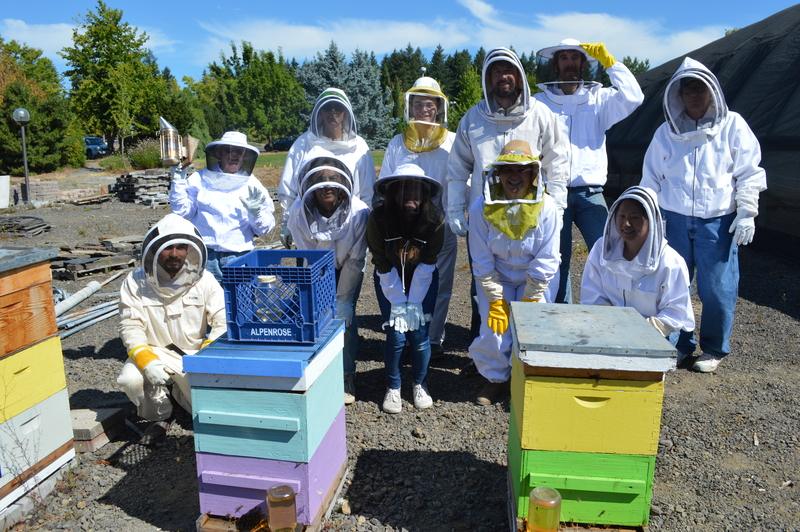 Two PCC students, Kendra Peters and Katie Richter, will be working with Elizabeth Brewster (LAT), Miriam Latzer (Learning Garden), Anne LeSenne (LAT), and Jaimie Powell (Biology) on the Oregon Bee Project. 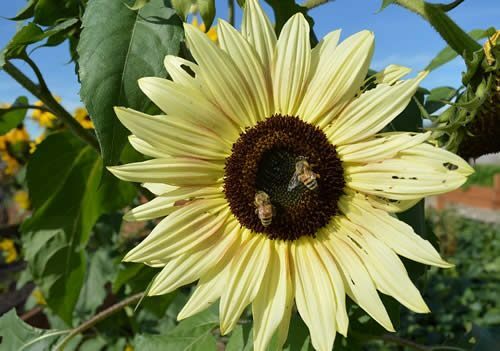 This project, managed by the Oregon Department of Agriculture and Oregon State University, is designed to “increase pollinator habitat, safeguard pollinators against pesticide exposure, and increase general awareness about Oregon bees”. The PCC students and the rest of the monitoring team will be working on collecting and identifying native bees at the Rock Creek Campus the summer and fall of 2018. Their results will be included in the Oregon Native Bee Atlas, an extensive study of the bees of Oregon. Donors: BEE a Bee Supporter! Participate – We welcome campus volunteers to join in our efforts. 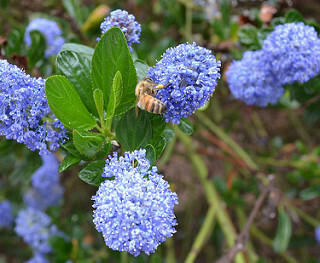 Participate in an event during Pollinator Week each June, tend pollinator habitat on campus and volunteer in the garden. Educate – Learn more about the plight of bees and other pollinators then share the information with your networks. Anyone can make a difference, in big or small ways, and we need everyone to be aware of the threats to the world’s pollinators. Bees are easy to help. Get started today! Donate – We need materials, supplies and bees to grow our apiary. Supports our current bee hives. Includes pollen patties and sugar for supplemental feedings, feeders, hive tools, smokers, queen excluders, frames, foundation, honey jars, and more. Mason Bees, a native bee of our region supports installation of Mason Bee houses on each campus to attract mason bees. Help us increase and maintain a healthy pollinator habitat. This provides full season food sources, pollen and nectar for our pollinators. 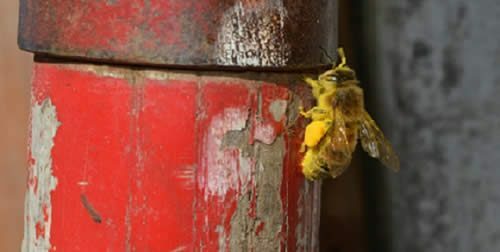 Winter is hard on bee colonies, frequently causing significant losses each year. Your support will enable us to replace any we lose and help bolster the strength of our apiary. 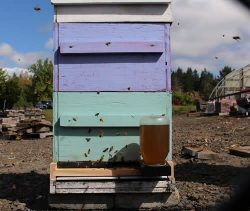 Our current Flow Hive generates over 3 gallons of honey annually – all harvested without disturbing the bees! Additional Flow Hives allow us to grow our apiary and increase honey production with minimal impact on the hives. Colony and Hive sponsors will be recognized with signage and apiary visits facilitated by Master Beekeeper Anne.